The BlueNEXT MN-WD152B is a high speed USB 2.0 WIFI dongle adaptor that supports 2.4G with 150mbps PHY Rate for both transmit and receive. Complies with IEEE802.11n. IEEE802.11g and IEEE802.11b standards. 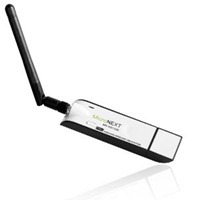 Supports 64/128-bit WEP, WPA and WPA2 encryption methods and 802.1x security authentication. Additionally, the MN-WD152B supports QSS functions, which can help you create a wireless connection with effortless security setup, to prevent outside intrusion and protect your personal information from being exposed. Reaturing high performance transmission rates, simple installation ans adaptability, as well as strong security, the MN-WD152B is a perfect solution for home or small businness networking. I tried to download the MicroNEXT MN-WD152B Driver for Mac OS, but the page does not excist.